Who Says Losing Weight Is Expensive? What if I told you you could have the body you've always dreamed of without spending your money on personal trainers? It may sound too good to be true, but it's not. Consisting of two gliding discs and five different range resistance loops bands, your Autdor Home Fitness Equipment helps you lose weight and tone up without setting foot in the gym. 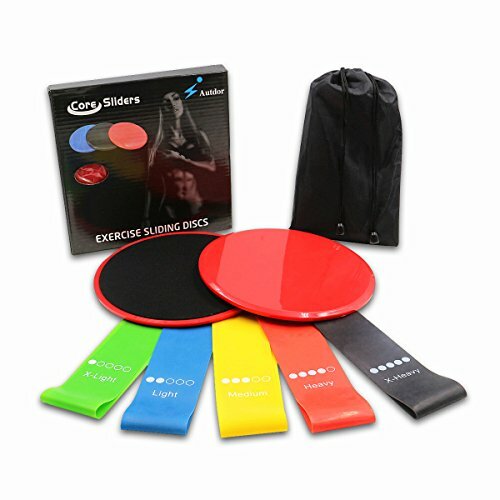 What can you available if buy Autdor resistance band set? What is the benefits of Autdor resistance loops and foot sliders? What effect can be achieved using Autdor Fitness Equipment for? Just tone up your arms, this magical fitness equipment can be used to target all muscles groups, from quadriceps to abs and glutes. So don't be surprised if, by using them regularly, you'll start to: Regain your balance and strength, Become more focused and flexible, Build muscles and torch calories and Lose weight and keep it off Home. Autdor Team is committed to creating high quality resistance loops and foot sliders for exercising as well as ensuring customer satisfaction. You are backed by our lifetime no questions asked replacement guarantee. What are you waiting for? 100% MONEY-BACK GUARANTEE - If you are not satisfied with your purchase's strength sliders and 5 resistance loops set, be free to contact us. We'll offer you a FULL REFUND or a new REPLACEMENT. Enjoy this absolutely RISK FREE purchase. We stand by our products and only manufacture the absolute BEST! Click 'Add to Cart' to set off on the path to washboard abs, toned muscles, and improved flexibility completely risk-free! If you have any questions about this product by Autdor, contact us by completing and submitting the form below. If you are looking for a specif part number, please include it with your message.